JOST International received their Incentive check for the energy upgrades they installed at their corporate office and manufacturing facility in Grand Haven, MI. Quality Air performed the installation of building temperature controls, a new variable frequency drive on their HVAC, and optimal start/stop on air handling units. These upgrades will allow JOST to significantly reduce their energy consumption, which will also lower their operational costs. JOST International is a leader in the production and manufacturing of fifth wheels, landing gear, kingpins, and many other products. The energy upgrades to their facility helped JOST qualify for Utility Incentives through Grand Haven’s Energy Smart Incentive Program along with Efficiency United’s Incentive Program. JOST received a total of $9,233 to allow for future energy saving strategies. MYESCO handled the complicated Incentive process for the project, allowing JOST to receive the maximum Incentive amount. Upgrading any of your current building controls or HVAC systems could potentially qualify for Incentives with your utility providers. The experts at MYESCO can help you sort through available options/projects that will lower energy costs at your company, while also earning Utility Incentives. Contact us today! A regular maintenance program for your heating equipment is relatively inexpensive and will help to increase equipment life, while providing energy savings. Periodic tune-ups should be a part of any program and will keep your boiler(s) operating at peak performance levels. A local High School recently performed a tune-up to their process boilers as part of their routine maintenance program. DTE offers Incentives to customers who perform tune-ups to their heating equipment through their respective Incentive Program. 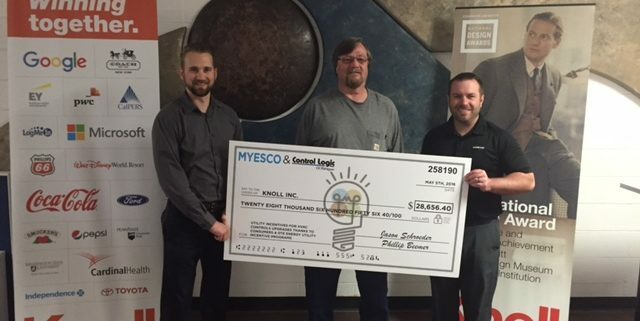 MYESCO (a registered DTE Trade Ally) handled the complicated Incentive process for the High School, which allowed them to receive a $2,585 check from DTE for the tune-up. It may be time to perform regularly scheduled maintenance or tune-ups to any of your heating/cooling equipment. Major utility companies offer incentives for these types of projects. Here at MYESCO, our team of experts work to find you the maximum incentive amount available. Contact us today to get the process started! Knoll, Inc. recently installed a new web based Building Automation System (BAS) at their facility in Kentwood, MI. The system will allow the building owners/management to have more control over their heating and cooling units, lighting, and ventilation systems. Control Logic Of Michigan installed the new BAS, which will significantly reduce energy consumption at the facility. These energy upgrades will also provide lower operational costs moving forward. MYESCO worked to secure and process Utility Incentives for the project through the Consumers Energy and DTE Incentive Programs. These programs offer a wide range of Incentives to customers who complete energy upgrades and/or construct energy efficient buildings. Knoll, Inc. received their check for $28,656 from CE and DTE for the improvements they made. Upgrading to a new Building Automation System could provide multiple benefits to your company or organization. The life cycle of utilities will improve, operational costs will be lowered, and qualifying upgrades will be eligible for Utility Incentives. Here at MYESCO, we can show you the best options to reduce energy consumption at any of your facilities. Contact us today! A University in southeast Michigan recently designed and built a brand new addition to their current fitness center. It allowed them to better accommodate the needs of their growing population of student athletes. MYESCO worked with the University’s design team to help identify energy-efficient equipment that would exceed standard building practices. A final design for the addition was created that showed the proposed building is 41% more efficient than ASHRAE 90.1-2007. The design also projected annual savings of 97,983 kWh, allowing the University to experience reduced operational costs moving forward. The design process also resulted in the University receiving a Utility Incentive Check from Consumers Energy for $12,412. MYESCO is a registered CE Trade Ally and helps companies maximize their incentives through the CE Incentive Program. If you are planning to construct a new building or an addition to an existing facility, contact MYESCO today. Our team of experts can identify the best design choices to meet your facility’s needs while also allowing you to receive the best Incentives available for your project! One of the most successful energy management tools that can be applied to HVAC systems is the variable frequency drive (VFD). Installing them on fan and pump motors can provide large energy savings which result in a great return on investment. Aspen Surgical, a worldwide leader of specialty medical products, recently implemented energy upgrades to their Caledonia facility. This included VFD installation on their HVAC Fans. MYESCO worked with their contractor on the project, Van Dyken Mechanical, Inc., to secure Utility Incentives for them. This resulted in Aspen Surgical receiving a $1,200 check from Consumers Energy through the CE Incentive Program. MYESCO is a registered CE Trade Ally and handles the complicated incentive process for our customers. If you are thinking about making any energy upgrades, contact us today. Consumers Energy and DTE offer incentives through their respective programs for a wide range of energy projects. We will maximize your potential incentives on any upgrade you may be considering.